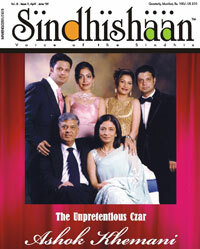 Congratulations for publication of your magazine “SindhiShaan” for over eight years, notifying in volume 7 for October-December 2008 received just yesterday. Just to encourage Sindhi publications I try to subscribe. But I have sad experience also. I have paid thousands of rupees to several publications that have just stopped publishing. I give you credit. Your publications are regular and never appeal for donations. Weekly Sindhis in Arabic script : With a view to encourage, I am life subscriber to ten Sindhi weeklies. Although their life subscription is six hundred, I have paid one thousand to each of them. Out of ten, at present, I am getting only three. I also receive books from my well-wishers. But I don't believe in getting free. I send money to them. Though some object, but I insist and prevail upon them. They spend money and why should they give free. And I don't keep the books with me. After reading, I circulate amongst others who can read in Arabic script. My account with you : I donot recollect for what period, I have paid for SindhiShaan. However I am enclosing my fresh cheque for Rs. 1,000/- which will suffice for three years more. After about four months I shall be completing 93 years. As such if I am alive, I can get your magazine upto the age of 96. Correct? Your letter has been the best gift to 'SINDHISHAAN' on its 8th birthday. Its only such encouragement and appreciation from sincere elders that encourages me to carry on with this 'junoon' of mine. I hope we continue to remain deserving of your blessings and good wishes in times to come. As per our records your subscription has been paid till 2011 and your cheque for Rs. 1000/- will keep your subscription going till 2014. Normally I do not accept subscriptions for more than 2 years, as unlike the life time subscription practice prevailing with other publications, I do not wish to end up owing any amount to anybody, if due to unforeseen circumstances I am forced to stop publishing, in which case I know exactly how much I have to refund to my subscribers. I'm enclosing my views on “Life time subscription” as published in VOL 6, ISSUE 2 of SINDHISHAAN – sometime back. However in your case I make an exception and will not return your cheque as I want to ensure that you remain with us, not only till 96 but till 99, and before your turn 99, I will ask you to subscribe for another 5 years! I sincerely pray for your long life with good health.